OREN HILL APART The OREN HILL APART is located in picturesque and relaxing surroundings. The clean, modern apartments are within reasonable walking distance of the resort centre and the beach. Location The apartments are close enough for you to enjoy the shops, nightclubs and bars in the resort centre only 700m away. However you can get relative peace at the hotel. Icmeler beach is 900m away. 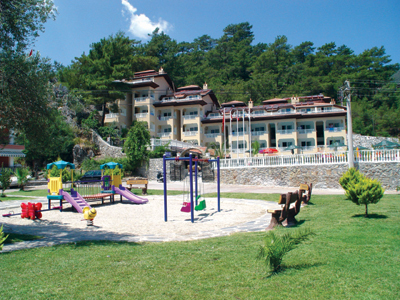 The Apart has *24 Hours reception *Money exchange *Safety deposit box *Snack bar *Restaurant *Billiard table *Hot water system *24 hour open poolbar *Restaurant open 7am to 12 pm *Wheelchair access *Childrens play ground.And for the children;The hotel has also a childrens park front of the hotel,with slides, swings and some other equipments, for the enjoy of the children. For the enjoy of the whole family hotel has a pool table,mini football table,Dart table.